Disclaimer: While searching for a good IPA recipe, I discovered the following on a forum online. I am not claiming authorship of the recipe below. If the forum post I read is factual, and I have no reason to think it isn't, this recipe includes input from one of the Rhinegeist brewmasters. That means it probably can produce a beer very close to the original. I plan to brew it at some point to see how it turns out. For now, I'm just documenting and sharing the recipe here. Update 06/11/2017: I've actually tweaked the recipe for my equipment and brewed a batch, following as much of the brewmaster's guidance as possible. You can see the results here. Notes from the Rhinegeist brewmaster say that they use 20% Golden Promise malt, 2% CaraRed, 4% Flaked Rye, and 5% Vienna and mash at 150F. The brewmaster also says that they hop with 30 IBUs worth of Bravo at 60 minutes, 20 IBUs of a 2:1 mix of Centennial and Simcoe at 20 minutes, and 16 IBUs worth of a 2:1 mixture of Centennial and Simcoe at 10 minutes. At 0 minutes they and Centennial, Simcoe, and Citra then steep for 45 minutes before cooling. They dry hop with Amarillo, Simcoe, and Citra for 7-8 days. They suggest you shoot for a starting gravity of 15 Plato or 1.061 SG, and try to attenuate down to 1.9 Plato or 1.007 SG. Mash with 8 gallons of water for 90 minutes @ 150F. Raise to 170F over 7 minutes for mash out. Boil for 60 minutes with the hops scheduled as noted above. Perform a hop stand by turning off the heat but waiting for 45 minutes to cool the wort after the boil. Ferment at 65F for 3 days. Ramp from 65F to 70F over 4 days. Add dry hops on day 7. Cold crash with a gelatin addition for 3 days. My wife is a big fan of pumpkin ales. Some time ago, I purchased the ingredients for one that I never got around to making until today. If you look at the Northern Brewer web site, you may recognize this as being similar to their Smashing Pumpkin Ale recipe. That was my starting point. I added Butternut Squash to it because we had one in the kitchen that we had no plans for. 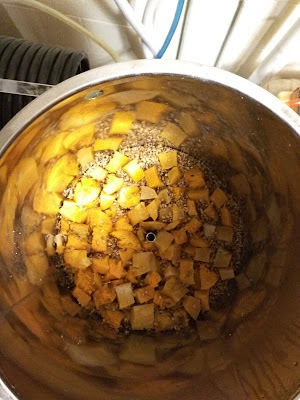 I also added Melanoidin Malt to give it a little bit of the crust/biscuit flavor that you find in Southern Tier's Pumking. I could have added Victory Malt like they do, but I am hoping the Melanoidin will give a more subtle crust-like flavor and some added sweetness to accentuate the pumpkin pie flavor profile. I bought the grain for this recipe over a year ago and hadn't used it. I decided to get it out and make it, not knowing if the age of the grain would ruin the result or not. Even if it did, I figured it would be good practice to make it. 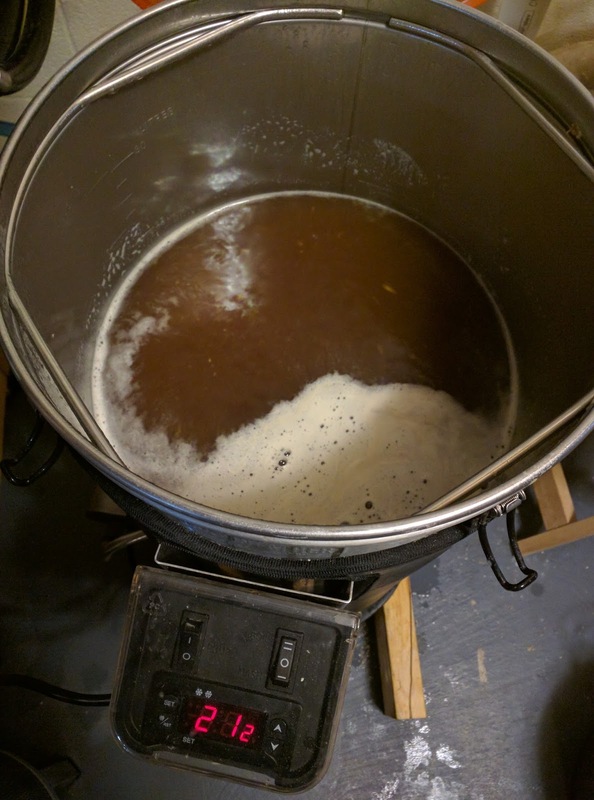 After the beer is finished brewing, I'll update with the ABV and other info. 4.75 gallons tap water place in the kettle with a Campden Tablet to remove chlorine and chloramine from the water. 2.5 gallons place in the sparge water kettle and treated with part of a Campden tablet to remove chlorine and chloramine. Grains and squash added, plus pH 5.2 Stabilizer added. Recirculation pump turned on. Grain basket is removed, grains removed from it, and the basket cleaned while wort reaches a boil. 0 minutes: Add pumpkin pie spice, remove hop spider and hops, whirlpool while running cold water through wort chiller to cool it down. Pump wort into fermenter. With the wort temperature in the 59-75F range, I pitched the US-05 dry yeast directly into the wort. Owing to unusually cool tap water, wort entered the fermenter at approximately 64.6F. I calibrated the temperature on the InkBird controller and attached a fermwrap heater to get the wort into the recommended 59-75F range for the yeast. My goal is a 1-2 week fermentation, followed by cold-crashing and then bottling. On February 25, 2017, I decided it was time to bottle the brew. A refractometer reading of 7.9 Brix, adjusting for original gravity and the presence of alcohol, gave me a final gravity (according to BeerSmith) of 1.015 SG and an alcohol content of 5.48% ABV. This is in the ballpark of what I was expecting. I calculated that adding 5.35 ounces of corn sugar to the bottling bucket should bring the beer to a finished carbonation level of 2.8 volumes of CO2. That should allow the aromatics of the squash and spices to be detectable, and combined with the Melanoidin malt give a nice head, too. My final yield was approximately 16 bottles of the 12 to 16 ounce size and at least 18 of the 22 ounce variety. The beer is cloudy at this point, with a nice orange color to it, a hint of pumpkin spice to the aroma, and a mild flavor. The flavor hints at the squash and spices, and is neither too bitter or too sweet. I'm happy with it at this point, though the real test comes when it's conditioned and chilled. The bottles were placed in my marine cooler with a heating element and temperature controller set to keep the "hot box" at 76F inside. My plan is to leave the bottles here until March 11, 2017, when I'll chill one and see how the carbonation is. If the beer is properly carbonated, I'll chill it for a few weeks in the fridge to clarify it a bit. The only issue I had during this one was the sparge. My sparge water got too hot before I had removed the grain basket from The Grainfather. It had reached over 200F. I turned off the heat and allowed it to cool, but it cooled a little too much and ended up around 150-160F when I started the sparge. Sparging took quite a bit longer than usual, probably because of the cooler water. (By the end of the sparge it had gotten down below 150F.) That's a mistake I don't want to make again. It didn't seem to hurt the gravity or volume, just took a lot longer to complete the sparge. Owing primarily to a lot of sediment in the kettle, I didn't achieve the 5.1 gallon volume I expected in the fermenter. I decided to turn the pump off before it sucked up too much of the sediment, which resulted in reaching just under 5 gallons in the fermenter. Update 3/5/2017: The beer has been conditioning in the bottles for about a week now. I popped one in the fridge yesterday and opened it last night. At this point, it's a cloudy orange-brown color with a very thick long-lasting head (thanks to the Melanoidin malt I expect). The first thing I noticed was a diacetyl aroma and flavor, which took some work to get past. Having opened a bottle too early in the past, my expectation is that this diacetyl issue will clear itself over the next week or so as the yeast finishes cleaning up the beer. I'm happy that there was no carbonation issue with this batch, as there have been with some other recent batches - so taking the additional time to calculate the proper priming sugar dose based on volume and temperature seems to have helped. If you've read this blog for any amount of time, it's no secret that I am fan of Belgian style ales. I've made at least six different Tripel recipes that I can remember, several Quadrupels, two or three Trappist Singles, and before this, two Dubbels. One was an extract beer that turned out OK. The other was an all-grain beer that was easy to drink but just didn't hit the mark for me. The recipe I brewed on February 5, 2017, started out as a clone of La Trappe Dubbel. La Trappe's Dubbel is one of my favorites. When I started assembling the ingredients for this one, I began wondering about my Saaz hops. They were a bit older, and were only 3.2% alpha acid to start with. My concerns were that they might not bitter the beer enough, and that adding a lot of them might trigger a grassy flavor in the finished beer. So I made the decision to use some German Northern Brewer hops to handle the bittering. They were fresh and certainly strong enough at 10.1% alpha acid. I would add a second addition at about 20 minutes to provide some flavor, using the Saaz and a packet of Styrian Goldings I had that was only 1.4% alpha acid. I like the flavor combination of Saaz and Styrian Goldings in a Belgian ale, so I reasoned it would work well here. As I write this, the jury's still out. Given the grain bill, the Grainfather calculations recommended 5.1 gallons of mash water and 5.1 gallons of sparge water. I rounded both of these down to whole gallons, mashing with 5 gallons and sparging with 3. I ended up having to add possibly a quart to reach the 7-gallon pre-boil volume. Heat 5 gallons to 149F. Add grain to the grain basket, stir to ensure it's all moistened. Add pH 5.2 Stabilizer to the mash water and start the recirculation pump. Pre-boil gravity after some stirring registered 10.3 Brix vs. the 11.7 Brix I expected. I have not yet determined why my gravity was much lower on this batch than usual, but I do have a suspect. I had trouble attaching the recirculation arm to the valve. In the process, I think I loosened the valve from the rest of the recirculation tube. When I returned near the end of the mash, there was a puddle on the basement floor where the valve had leaked wort onto the floor. My suspicion is that the loss of some amount of wort, combined with the the fact that the leak probably prevented the recirculation from working properly, lowered my gravity a bit. If not that, my grain mill may need adjustment. It may not have crushed the grains as finely as needed. The leak has since been fixed, but I still need to look at the mill. 0 minutes: Turn off the heat, whirlpool the beer. Run cold water through the chiller to cool it down, then begin pumping wort into the fermenter. My final kettle volume was a little over 6 gallons. In the fermenter, accounting for shrinkage from cooling and losses to trub in the kettle, I still had 5.9 gallons. The gravity in the kettle measured 13.9 Brix versus the 15.4 I'd been expecting. That was probably due to the mash issue. Still, even at 13.9 Brix or 1.056 SG, it's well within the guidelines for the Dubbel style. The counter flow chiller dropped the wort to 67F in the fermenter, which was ideal for the yeast. The recipe called for oxygenating the wort before pitching the yeast, which I accomplished by dangling the tube from the counter flow chiller high up in the fermenter. This ensured that the wort splashed as it entered the fermenter. If you're thinking that wasn't enough oxygenation, stay tuned. I attached my fermwrap heater and Inkbird temperature controller to the fermenter. I had the cooling system nearby, but doubted that I would need it for this beer. 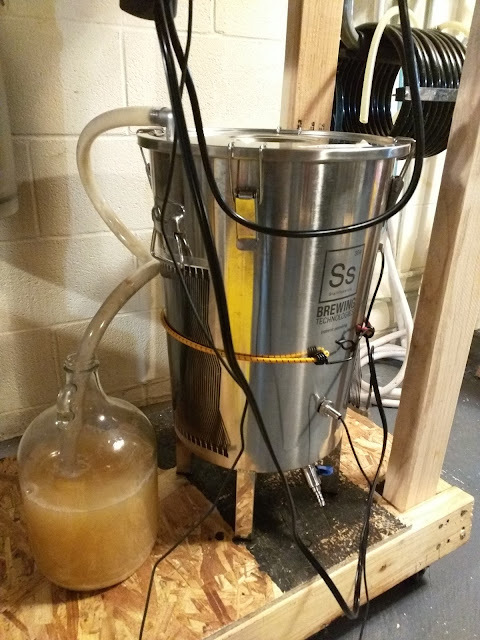 Since the nearly 6-gallon wort volume was close to the top of my fermenter, leaving perhaps a gallon or so of head space, I decided to forego the airlock and use the blow-off tube instead. The morning after I pitched the yeast, there was regular burping in the blow-off liquid container. A day after pitching, the burps were about a second apart. When I checked it two days later, there had actually been blow-off through the tube and into the gallon jug underneath. While I'd been concerned that I hadn't oxygenated the wort before pitching the yeast, it doesn't appear that the yeast minded. Sep. 18: Per the original recipe, it should be cellared for six months. My best guess is that the finished beer will read as 8.5 Brix on the refractometer (adjusting for original gravity and alcohol). That will correspond to a final gravity of 1.014 SG and an alcohol content of 6.67% (ABV). Update 02/12/2017: The yeast is still apparently working hard. When I've checked on it, there are burps from the blow-off tube approximately every 10-15 seconds. I'm not planning to chill it until those appear to have stopped. Update 02/15/2017: I extracted a sample from the fermenter to taste before moving it to the mini-fridge for lagering. The sample has a pleasing but yeasty aroma. The flavor is much more dry than I expected it to be, given that it's supposed to be cloning the La Trappe Dubbel. Color looked good. It was understandably cloudy. The beer will now spend 4 weeks at 50F before I see it again. The original recipe called for priming with Simplicity Candi Sugar at 31 grams per gallon of wort and cellar conditioning for six months before serving. I'm planning to aim for 3 volumes of CO2 and to allow it to cellar as long as I can stand it. I'm not sure if I'll use corn sugar or Simplicity to prime it. Update 3/12/2017: Looking at my work schedule, I saw that I would be on-call next weekend when the beer would reach its four-week lagering time. I decided to take it out a week early and bottle it today, when I am not going to potentially be interrupted by tech support calls from the office. Using BeerSmith's Carbonation Tool, I entered the desired CO2 volume of 3.0 volumes, beer temperature of 51F, and volume of 6 gallons. This indicated that I would need 5.9 ounces of corn sugar to carbonate the beer. I couldn't get 5.9 ounces to read consistently when I weighed it, so I ended up settling for 6.05 ounces instead. Some of my recent brews have been undercarbonated anyway, so I figured this might help. The gravity on the refractometer read 8.1 Brix before priming sugar was added. BeerSmith indicates that this is a corrected gravity of 1.017 SG and represents ABV of 5.1%. The aroma of the beer is excellent, combining dark fruit, plum, and caramel malt. The fruit component of the flavor is lower than in the aroma, but still very present, along with some hops bitterness. All in all, I think it might be the best tasting Dubbel I've made - and one of the best I've had. I'm reserving judgment until the beer finishes cellaring, however. Yield for this batch was 25 bottles at 22 ounces and 10 bottles at 12 ounces. While I am disappointed and puzzled that the wort came in well under the gravity I expected, I am fairly sure that the cause is the leakage from the recirculation tube. That may have been exacerbated by the grain mill not being set fine enough, which I'll need to check. I'm happy that I decided to attach the blow-off tube rather than an airlock. Judging from the color of the fluid in the blow-off jug, I suspect that an airlock would have been blown off the fermenter and some amount of wort sprayed around the basement in the process. That didn't happen, though the blow-off jug will definitely need some cleaning when it's all done. Update 3/18/2017: I chilled and opened a bottle yesterday to share with family members who were visiting. The beer is beautifully clear with a nice reddish brown color. It generates a long-lasting but relatively thin head and doesn't seem to be quite as carbonated as I expected - given the amount of priming sugar I used. The flavor at this point is very balanced. It's smooth and easy to drink, but for my taste lacks the sweetness and fruit elements I like and expect in a Dubbel. I'm hoping as this cellar conditions over the next few months that it will get better. Update 5/22/2017: The beer is getting a little better with age. I've made the decision to enter it in two home brewing competitions. The first is a local competition here in Central Ohio. The other is a state-wide competition, which will pit it against some of the best home brews around Ohio. I will be back to update this post when I have the feedback in mid-to-late June. Update 6/10/2017: I received the judges' comments from the state fair today. I'm reproducing the notes and scores below. Brew sooner: This recipe called for six months of aging, but I didn't make it until March. What the judges got to sample was a beer that was only about three months aged. I'll brew the next batch in December and have it ready for next year's competition. Reduce hops bitterness, increase flavor: I felt, and the judges agreed, that this beer came out too bitter for a Dubbel and had a bitter finish. I blame the Northern Brewer hops for part of that. I don't like the almost harsh bitterness they seem to impart to a beer. I didn't like them in my Quad either. I added them to help with head retention, but they're messing up the flavor. I'm going back to my Styrian Goldings and Czech Saaz mix that I like, and shifting the balance of additions toward later in the boil. Increase carbonation: Just need to add more corn sugar at bottling. Increase mash temp: This beer got dinged for being a lower-body example than it should be. I agree with the judges on that, and plan to mash a few degrees higher next time to get the body a little fuller. That will also add some sweetness to balance out the hops. This version was a bit too dry for my taste. Yeast Starter: Judges noted a "bready" element to it that I think might have been related to the yeast. While I used a fresh yeast and (probably) enough of it, switching to a starter would probably help with that. Temperature control: I'm going to try the "start low and gradually move up" temperature schedule for the beer next time, to see if that helps reduce the alcohol warmth judges noted. Add plums: One of the best Dubbels I've ever had, which was a one-off (?) batch Rockmill Brewing did for Smokehouse Brewing's Mini Real Ale Festival that included plums, still lingers in my memory fondly. I'd like to try adding plums or prunes to this to see if I can come up with something like it.